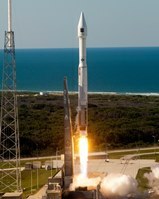 A United Launch Alliance Atlas V rocket blasts off from Cape Canaveral, FL carrying the fourth Global Positioning System (GPS) IIF-4 satellite for the U.S. Air Force. The IAM recently sent a letter to U.S. Rep. Mike Rogers (R-AL), chairman of the House Armed Services Strategic Forces Subcommittee, urging Congress to reject any attempt to reopen the Air Force’s block buy contract to launch GPS satellites into space. The contract, currently held by United Launch Alliance (ULA), is for the Air Force’s Evolved Expendable Launch Vehicle (EELV) program. Since ULA was created in 2006, it has completed over 80 launches with a 100 percent mission success rate – the only U.S. launch provider to do so. IAM members, who have been an integral part of every launch going back to the original Mercury program, are employed in the EELV supply chain that spans 20 states. SpaceX, the likely competitor for the EELV contract if it’s opened, is not certified to perform the launches provided by ULA. According to the Air Force, the block buy award to ULA will save U.S. taxpayers over $4 billion over the five-year life of the contract. Click here to read the IAM letter in its entirety.